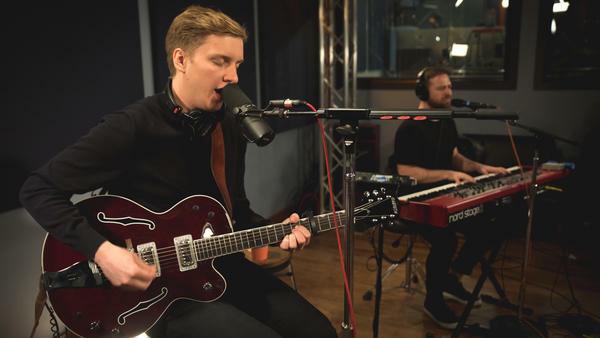 George Ezra inside the World Cafe Performance Studio. The first thing you notice about George Ezra, besides his incredible voice, is his demeanor. He's warm, friendly and engaging to talk to. There's a similar charm in his songwriting. Ezra pulls you in as a storyteller. You want to root for him. His 2014 debut LP includes the breakout smashes "Budapest" and "Blame It on Me," which showcase his voice and charm in spades. On the 24 year-old's sophomore album Staying at Tamara's Ezra and his producer, Cam Blackwood, add more production and more sheen, but keep Ezra's natural talents at the forefront. Love, anxiety and a healthy sense of escapism fuel this album. That might sound tricky, but it's an easy listen as George plays it cool and sweet throughout. In addition to launching his new album this year, Ezra launched a podcast, which makes him just like you and I — except his guests include Sam Smith, Ed Sheeran and, most recently, Elton John. Good gets! In this session, Ezra talks about the same stresses of being an interviewer that I have, but we start off with an in-studio performance of "Paradise." Hear it all in the player.